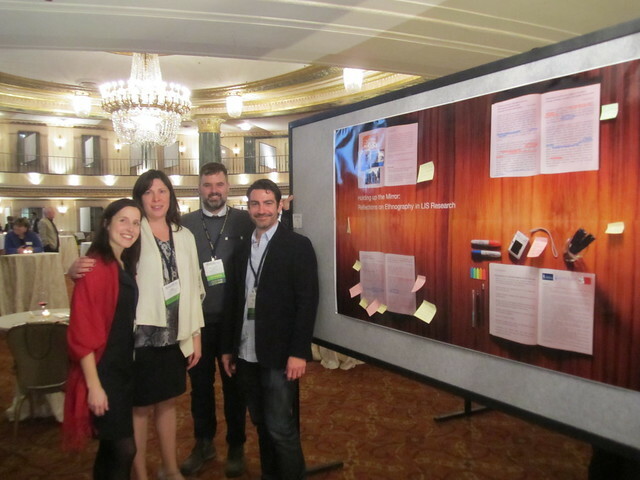 Eva Jansen, Elysia Guzik, Ben Walsh and I presented a poster about ethnography in Library and Information Science at ALISE in Chicago this year. An interpretive understanding of ethnography draws on assumptions and commitments shared with Emerson, Fretz & Shaw (2011) and is characterized by ethnographic participation, writing fieldnotes, inscribing social discourse, and reflection. While ethnography has been used as a methodological framework in Library & Information Science (LIS) research for at least two and a half decades (see Chatman, 1992; Hartel, 2007; Mehra & Braquet, 2007; Mehra & Srinivasan, 2007; Michels, 2014), it remains marginalized and represents only about four percent of methodologies used in existing LIS literature (Julien & O’Brien, 2014). Yet ethnography offers a promising avenue for focusing on the perspectives of participants, and the particular contexts in which information seeking and use occurs (Fidel, 2012). Moreover, ethnography provides a lens through which we may examine the relationships among language, social conventions, institutions, knowledge and power, which are inherently tied to our everyday lives and our engagement with libraries (Savolainen, 2008; Sundin & Johannisson, 2005; Tennis, 2008). This poster offers a reflection on characteristics of ethnography drawn from current dissertation research projects in LIS. In particular, we consider our experience exploring the information practices of Muslim converts; culture and standard occupational classification; the information practices of performing artists; and information access and exchange among homeless queer and trans youth. Our poster will consider some ways ethnography – as both metatheory and method - helps us locate and situate our perspectives and values among information professions and cognate disciplines.